We’re continuing our series of blogger stories, and handing the podcast over to you so you can tell your stories and tips of starting and growing your blogs. This series, which started with episode 221, is all part of the launch of our new (and completely free) ‘Start a Blog’ course, which goes live on 10 January 2018. You can sign up to reserve your spot in the course at problogger.com/startablog. 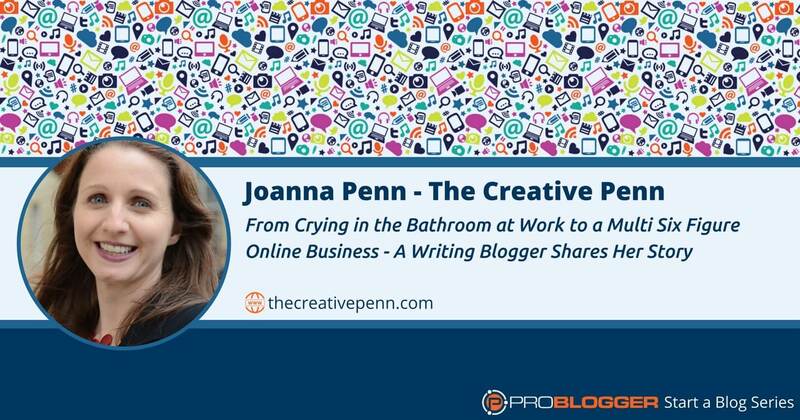 In today’s episode we hear from Joanna Penn, who has done amazing things with her blog at www.TheCreativePenn.com. Joanna blogs about fiction and non-fiction writing, independent publishing, and making a living from writing. And she’s built an amazing business around that topic. I first met Joanna at the very first ProBlogger conference in Melbourne back in 2010. Joanna is English, but at the time she was living in Brisbane, Australia. Blogging and podcasting has allowed Joanna to move on from a cubicle job she really didn’t like and build a business that not only brings in a multiple six-figure income each year, but has also provided many opportunities for her to travel and speak on the topic she covers. Joanna’s story is one of my favorites in this series, so settle in and enjoy. Darren: Hey there, it’s Darren Rowse from ProBlogger here. Welcome to Episode 228 of the ProBlogger Podcast. ProBlogger is a blog, a podcast, an event, job board, series of ebooks, and a course all designed to help you to start an amazing blog that’s gonna change the world in some way, and hopefully change your life too by building a bit of profit for you. You can learn more about ProBlogger at problogger.com. In today’s episode, we’re continuing our series of blogger stories which I started back in Episode 221. Essentially, this series is all about handing the podcast over to listeners so that I can share their stories of starting blogs. We’ve heard some amazing stories so far, and today I’ve got a really great one, an inspiring one for you. As I said, this started back in Episode 221, go back and listen to those previous episodes. They’re all relatively short stories, and some of the episodes actually have two or three bloggers sharing their stories as well. This is all leading up to our Start A Blog course which launches on the 10th of January, 2018, which is all designed to really help you to start a blog, or someone you know to start a blog. We all know someone who should be blogging, and my hope is that you’ll share that course with them. You can find the course and sign-up where you can register to be part of it at problogger.com/startablog. Please do feel free to share that with others. It’s a completely free course. In today’s episode, we’re hearing from a blogger who has done something quite amazing with blog and podcasting since she started. She has a blog on the topic of fiction and non-fiction writing, covers independent publishing, and making a living with your writing and has built an amazing business on that particular topic. The blogger’s name is Joanna Penn from thecreativepenn.com. I know many of you are familiar with Joanna already, because she’s been hanging around ProBlogger for years now. In fact, I first met her at the very first ProBlogger Conference back in 2010, back in Melbourne. Joanna is English, but at that time she’s living in Brisbane, Australia. Blogging and podcasting has enabled Joanna to move from a cubicle job that she really didn’t like in a sort of a corporate environment to build a creative business that not only brings in a multiple six figure income a year, but has opened up amazing opportunities for her to travel, to speak, and to do what she loves, and have a creative life. Joanna’s story is one of my favorites in this series so I hope you enjoy it. You can find the show notes with the full transcript of the story as well as links that she mentions in the show notes at problogger.com/podcast/228. I’ll be back at the end of Joanna’s story to pull out a few of the things that I hear her saying just to hammer them home so that you come away with some action items. Joanna: Hi everyone. I’m Joanna Penn from thecreativepenn.com. I blog and podcast about writing fiction and non-fiction, independent publishing, book marketing, and making a living with your writing. I started my site, thecreativepenn.com, in December 2008 as a way to share my journey and my lessons learned about writing and self-publishing my first book, as well as the ups and downs of marketing, something where nobody knows who you are. This was before the International Kindle, before print on demand, before we had the independent publishing ecosystem we have now. I also started a podcast in early 2009 as a way to learn from other people who were doing well, and also to meet other creatives. By sharing my lessons learned, I was able to meet other people going through the same experience and attract a community and friends overtime. I was also living in Brisbane, Australia at the time, and most of the self-publishing early birds where in America, so I was able to use my site and my podcast to meet a lot of Americans online. I was also a miserable cubicle slave at that time, implementing accounts payable into large corporates, one of a not very creative job, and I really wanted to find new friends who were writers and online entrepreneurs. My big goal was to leave my job and become a creative entrepreneur and make a living online that was location independent and be able to travel, and create, and live a much happier life. Looking back, I’m really grateful that I learned from professional bloggers and invested in education early, because otherwise you can make so many mistakes. I did make mistakes but I learned to avoid a lot of them by studying. I was living in Brisbane, as I mentioned, in Australia, and I learned from Yaro Starak at Entrepreneur’s Journey, and actually met him because he was living in Brisbane too at the time. I modeled my blog on his, and I even still have a successful author blueprint as my giveaway for email list building that I modeled on his, and followed his training course exactly. I also attended the first Problogger event in Melbourne, in 2010, where I met Darren and other people making a living online and it inspired me to follow that example. Setting up my site on WordPress and following search engine optimization design principles just has set me up so well. It’s meant that I haven’t had to do hugely horrible re-designs which I’ve seen other people go through because they set up on other platforms. Also, learning about headlines and doing audio and podcasting so early has all really helped my business scale. I definitely recommend investing in education so you can set things up right from the very beginning. In terms of mistakes, I actually made some mistakes before thecreativepenn.com, which was my third blog. The first blog I set up was centered around my first book. I’m so tied to it, including the URL was actually the book title, that when I started writing other books, because now I have like 26 books, writing around one book was never going to last long enough. The second one was a niche that I then got really bored with. A really big tip is to choose a URL with the intent that this is going to last 5-10 years, maybe much longer. I’m just coming up myself on my 9 year anniversary. I can use thecreativepenn.com basically for the rest of my life. I can pivot that into all different kinds of things. I also have a fiction site at jfpenn.com. Again, around my name, which means that won’t change. What do you see yourself doing in 5-10 years’ time? What won’t age too much along the way? What are you so excited about that you never run out of content for? The moment I have six months worth of content scheduled ahead of time, that’s how much I have still to share after nine years, and I’ve never, ever run out of content, I always have more ideas. This is so important. I found with those other two blogs I was just bored, and I didn’t want to write, and I didn’t want to podcast on these topics. Topics that last over 5-10 years, and what do you see yourself being known as, that’s really important too. Also, consider technology that my age, say for example, myspaceexpert.com would probably now be obsolete. I don’t know what that site is, I just came up with that. Yes, those would be some mistakes that I made that I hope you can avoid. Some amazing things have happened since I started my site. At first, I ended up making money. In September 2011, I left my day job because I was making a few thousand a month from the blog, and with more time available I was able to write more and grow the site and write more books. My podcast also grew as audio became more popular and self-publishing as a niche went mainstream. Meaning, I got a lot more traffic from SEO based on the content I’ve been producing for years. In 2015, we started to make a six-figure income in pounds from the blog and my husband was able to leave his job. Now, nine years after starting it, we make a multi-six figure income from our business, all powered by thecreativepenn.com. My blog, my podcast, and the books I’ve written along the way, which I sell to the audience that I’ve attracted along the way. It really has been a massive change in0 my life. My life is now completely different. I was that miserable cubicle slave, crying in the toilets at work because of how much I hated my job. I really, really just didn’t know what I was doing with my life. Now, I travel the world for book research trips and professional speaking opportunities that come because of my platform as a blogger and podcaster. I have a creative lifestyle that I love and a community of friends and colleagues who are also creative entrepreneurs. I had a vision of this life back in 2008. It just feels kind of amazing. I’m now living that. But if you put your words out into the world consistently for years, amazing change can happen, and you can live that life that you design. It really is amazing. In terms of my number one tip for new bloggers, I would say that you can think big, and you need to decide what you want to be known as in 5-10 years time. What can you create that will lead to that outcome, because you have to know where you want to end up, and that will really help guide you and keep you going in the nitty gritty bits because there are nitty gritty bits when you are blogging. Secondly, I would say that learning how to write a good SEO optimized headline, and a really decent image. Those two things together will help your work be more shareable, and I use canva.com almost everyday to create shareable images, and it’s a free site, it’s amazing. Decide what you want to be known as and learn to write a good SEO optimized headline and make a good image. I definitely say that blogging for me was the beginning, the turning point of what changed my life. I am so happy that I started blogging, and so happy to be part of the blogging community, and I wish you well. Thanks to Darren, and the ProBlogger Team, and happy creating. Darren: That was Joanna Penn from thecreativepenn.com. I love the story, obviously an inspirational story. Someone going from working in a job that she didn’t really love to I guess having the freedom to be able to explore her own pathways and do something creative that she loves and to enable her partner to join her in that as well. A few things that really stood out to me in that, I love that tip that she gave about choosing a URL, and I guess a focus that’s not going to age. Something that’s gonna last you more than five years. That’s a fantastic question that she gave you there, what do you see yourself being known as in 5-10 years? That’s a great starting point in thinking about what your blog should be about, but it will also begin to give you hints as to the type of content you need to create. If you want to be known as an expert in a particular field, what type of content does an expert in a field need to create to take them to that point from someone who might be relatively unknown to being an expert, or obviously that will reveal the types of content you need to create. You need to create content that shows your expertise, you need to create some social proof, you need to create content that shows credibility, these types of things. Hopefully by identifying that end point, you can begin to fill-in some gaps in the short term that will take you to that place. Start with that question, brilliant question to start with, and those of you who are gonna take the Start A Blog course, that’s a question that I would encourage you to answer before the course starts. It’s gonna help you so much if you’ve got that end-point in mind. Then, what content can you begin to create that will take you to that place? There’s some really good question to be asking, whether you do the course or not. Even as an established blogger, that will hopefully give you a little bit more focus as well. Also, I like the idea that Joanna mentioned a number of times, just creating, it’s the nitty-gritty stuff, it’s the little things that you need to do that will end up taking you to that destination. We often hear the story of someone going from something that they don’t love, a job that they don’t love to a multiple six figure income, and we think that happens very quickly, it doesn’t. Joanna’s been at this now-I met her in 2010 towards the beginning of her journey, and she’d been going before that already. It’s the small actions that you take everyday and that she’s taken everyday that have actually taken her to that point. Also, I love the idea there of investing in education early, put the time into learning. She mentioned there being mentored by someone and actually putting the time into getting to know someone who can teach you and certainly that’s what we’re hoping that you will do with ProBlogger, but there’s plenty of other great bloggers out there in your niche that you should be investing the time into building those relationships. You will learn so much about blogging through those relationships. Invest the time into the reading and the learning that you can do, and there’s certainly some amazing resources out there, and much of them for free online as well. Put that time aside, it’s not gonna happen overnight. I really hope that you are inspired by Joanna’s story there, the tool she mentioned was Canva, we’ll put a link to that in the show notes today. Also, if you want to do some reading on search engine optimization, some listening on that, I’ll have some links in the show notes as well on that because that’s something Joanna did talk about. Really, I heard her mentioning a number of times, it was search engines that have been driving the traffic for her. This is one of the things that I think a lot of bloggers miss out on is they think the traffic’s gonna always come from social media. Traffic can come from social media, but time and time again I meet bloggers like Joanna and the key to their success isn’t social, it’s actually Google. I’m certainly not saying don’t put time into social, you need to do that, but also put time into learning the basics of search engine optimization and thinking very carefully about the headlines you use because they will help so much in SEO. I’ve got some further listening for you that I’ll include in the show notes today as well. The show notes can be found at problogger.com/podcast/228. Our Start A Blog Course can be found over at problogger.com/startablog. I’ll be back tomorrow with another blogger story. If you haven’t already listened, go back to Episode 221 and work through the six or so stories that we’ve got there. We’ve got bloggers who are DIY bloggers, we’ve got travel bloggers, we’ve got tech bloggers, a variety of different niches covered there so dig back in and look out for tomorrow’s episode as well. Thanks for listening, chat soon. The post 228: From Crying in the Bathroom at Work to a Multi Six Figure Online Business – A Writing Blogger Shares Her Story appeared first on ProBlogger.